Abrams Elementary is proud to announce another outstanding educator for this school year! 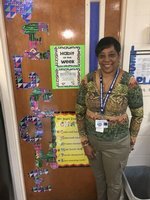 Congratulations to Gilda Watson--Abrams’ Teacher of the Year 2017-2018! For over 30 years, Ms. Watson has been an educator that has a passion for the work she does. Join us in congratulating Ms. Watson.